Kids (and moms, ahem) love PB&J sandwiches. And those Smuckers Uncrustables sure are a wonderful idea in theory, except they’re processed, too expensive, and honestly, can be done by yourself. You can make these fresh, or ahead of time and freeze them, all with a handy-dandy little contraption called the Cut-N-Seal® by Pampered Chef. This relatively inexpensive sandwich-maker (it’s only $9.50!) basically presses the two pieces of bread together, sealing along the outside into little pockets, and takes no more than 30 seconds from first press to last cut. I find that using a knife to make a clean cut around the edges works well. Our bread is kind-of spongy, y’know. Peel away the leftover crusts (which are mighty tasty to snack on, might I say), and Ta-da! Your Homemade Uncrustables sandwich is complete! You can make a bunch of these and freeze for school, too! Freezing your sandwiches will keep the contents cold for your child until lunch! This is also pretty easy enough that your children can help you make it! 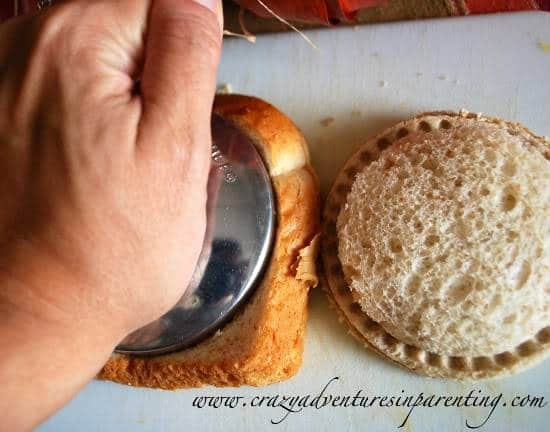 Other things you can make with the Cut-N-Seal® are homemade hot pockets using crescent roll dough or bread dough, personal pies and tarts using refrigerated pie crusts, and so much more! (Check out some of Pampered Chef’s recipes! My favorite is the Chicken Salad Tea Sandwich)! And you’re making these creations homemade, no added gobbledegook chemicals. Neat, huh? Never miss a thing! Subscribe today for all kinds of crazy parenting fun!